In what will go down as the most exciting moment of either team's season, a well-known Nets fan was physically ejected from last night's game against the Knicks. His prosthetic leg—which security guards said he had used to hit another fan, something disputed by multiple eyewitnesses—was left behind. Jeffrey Gamblero, 38, has been a dancing, neon-clad fixture at Nets games almost from day 1 in Brooklyn. Profiled by the Times last month, Gamblero is a graffiti artist and professional poker player, and lost his left leg below the knee in an unspecified accident at age 21. He's been embraced by the team to the point where Mikhail Prokhorov flew him to London on the team plane for a game last season. But to security at Madison Square Garden last night, where the Nets beat the Knicks 98-93, Gamblero was just another visiting fan. According to a pair of Garden security guards who declined to be identified, the man pulled off his prosthetic leg and hit another fan with it, inciting a ruckus in the upper deck. "They grabbed him and pulled him out," the staffer said. "I don't know if he was arrested but they got him out of there so he didn't start a riot." But fans sitting nearby insisted that nothing physical went down. "I saw what happened," one fan told the Daily News. "He didn't deserve to be thrown out. He was just into the game." Another told ESPN New York that Gamblero was "obnoxious and yelling" and that "people were complaining," but no mention of him swinging his leg. (Gamblero) was being his usual self, absolutely no cursing, no negative cheering, just dancing and loud cheering for the Nets. Never attacked a Knicks fan, never got out of hand. After halftime a guard came up and told him to "cool down and just be a fan." Obviously didn't know who he was. He said what did I do wrong? Should I be quiet? They said no, just cool it down. He started loudly cheering FOR the Knicks doing "go New York go New York go," etc. The guards came back and told him to stop. He said why? Is this a library? Then the main guard on the floor gave the signal to kick him out. He would not leave. A guard then touched his leg and he said "ouch you're hurting me I have a prosthetic leg." He then took off the leg, which is when things escalated. More and more guards surrounded him as he watched the game with his leg resting on his shoulder. They tried to get him to put his leg on, threatened to arrest him if he wouldn't, but he wasn't moving. I am a lifelong Nets fan but regardless, this was one of the cruelest and most upsetting things I have ever seen. 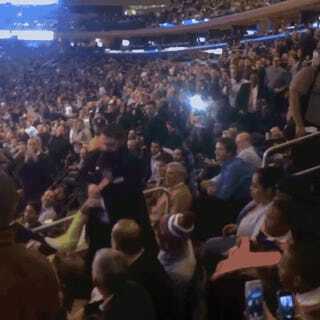 An unruly fan was ejected after MSG Security received multiple complaints from fans sitting in that area. The fan was warned multiple times before being removed. He will not be permitted back into Madison Square Garden.